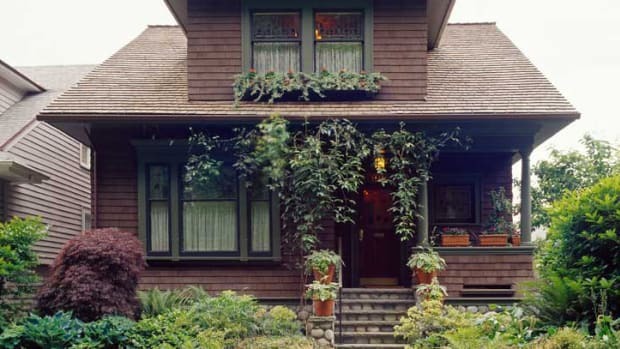 Designed by renowned architect Sylvanus Marston, the 1912 Lacey House is a dignified presence on a shady corner in Pasadena. Framed by a massive century oak, draped in wisteria, the 1912 Lacey House is the quintessential bungalow by the versatile Pasadena architect Sylvanus Marston. Framed by a massive century oak, draped in wisteria, the 1912 Lacey House is the quintessential bungalow by the versatile Pasadena architect Sylvanus Marston. Thanks to an exhaustive effort by Phil and Nancy Naecker and family, the house has, once again, a sound infrastructure and its stately beauty. They’ve been at it since 1991. The gracious bungalow has generous proportions and the semi-open plan of the period. 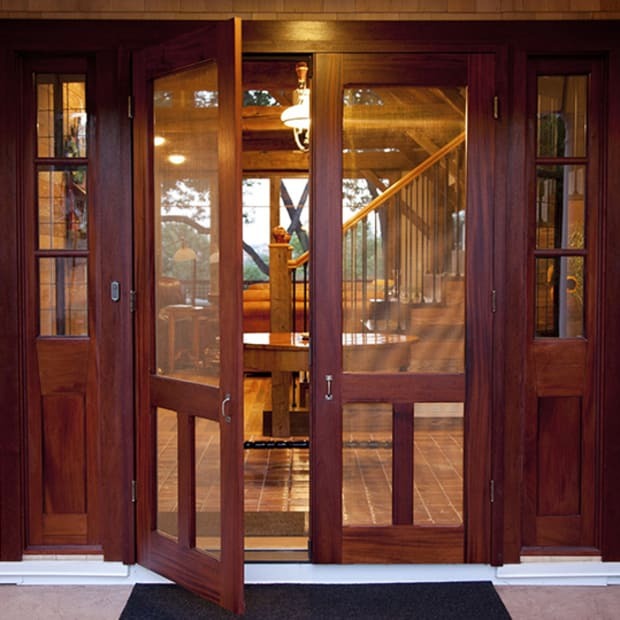 French doors and pocket doors allow versatile use of the space; the billiard room is off this main living area, with the dining room to the left. The shallow barrel-vault ceilings are delightfully uplifting. 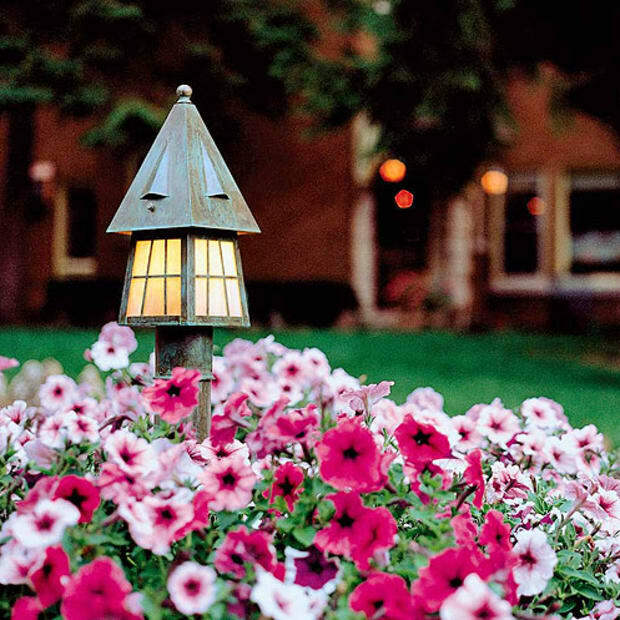 A wide front porch—truly a verandah—beckons visitors. Held on battered pillars made of boulders, it serves as an outdoor living room with a seating area and outdoor fireplace. The romantic bungalow seems to grow right from the boulder-strewn ground. The interior is dramatic with barrel-vaulted ceilings, a Batchelder fireplace, and a long, built-in dining room buffet. The courtyard, enclosed on three sides, is a loggia with a pergola roof where the wisteria climbs. It took a while to get here. Phil Naecker says the exterior work was the most costly and difficult. Past remodeling and weather damage had taken their toll, so the porte cochere needed to be rebuilt, beams and arbor made new, and rafter tails resawn. New brackets were fabricated to match the one that remained. The difficulty (and expense) came from the need to custom mill everything—the old (“standard”) lumber stock was beefier, so new stock items do not match. Also, the original beams and rafters had a heavy grain pattern and had been cut with a very large circular saw no longer in use today. Surface treatments were used to “age” the wood to match weathered original pieces. In a few cases, wood salvaged during a major repair was reused to replace a weather-damaged component elsewhere. With the removal of a failed internal gutter system under the edge of the rolled roofing, water is no longer the enemy. Now a shingle roof caps an extensive, hidden drainage system well integrated with the house. 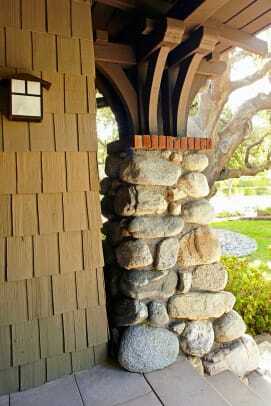 Sheltering eaves, well articulated rafters, and Japanesque brackets reminiscent of Greene & Greene are secure thanks to the Naeckers’ meticulous work. Opening from the dining room, a courtyard is formed by wings of the house. The pergola roof supports an old wisteria vine. 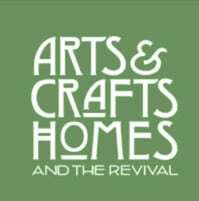 Besides a seismic upgrade for the foundation, the owners replaced heating, electrical, and plumbing systems. Alterations had left the interior in dire need of restoration. The wall-to-wall carpeting had caused a huge headache: for clearance, all the doors had been shaved. With the carpeting removed, dozens of doors were short—some rooms, typical of Marston’s houses, had five doors. All were fixed to furnituremaker standards. (Because they are painted, the extension patches—carefully matched for grain and thickness—are virtually invisible.) Air-conditioning units had been mounted into the wall paneling, and hot-water radiators placed in the flooring. With their removal, walls and floors needed patching, so Phil and Nancy searched out matching fir and oak. Used now as a family room, the billiard room is nearly original, with Port Orford cedar walls and doors to multiple porches. 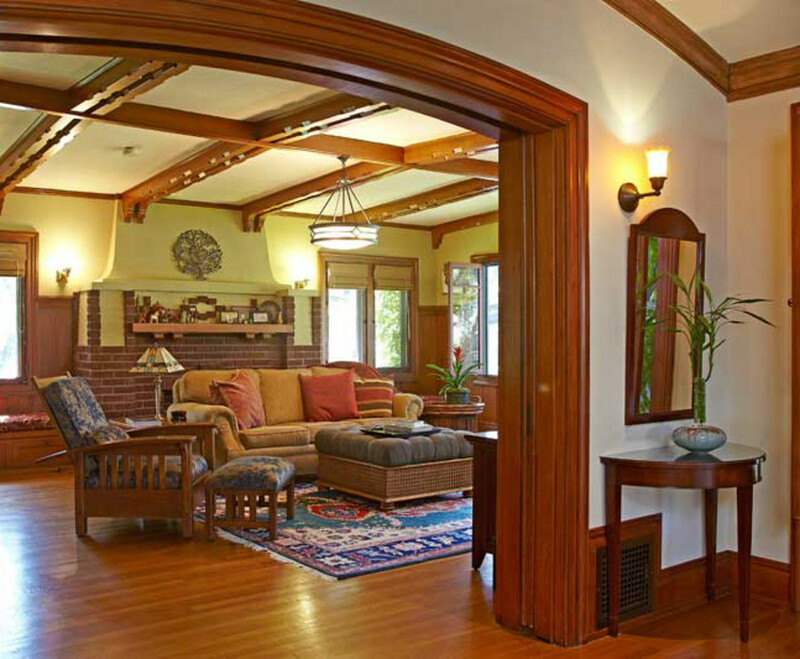 Rustic brick surrounds the fireplace; ceiling beams are carved with a Southwest-style motif. The chandelier is a reproduction in Arts & Crafts style. The original billiard room was the least altered, its Port Orford cedar paneling still wearing the original varnish. (It has patinaed to an orange-peel texture in exposed places, but the finish is near-perfect inside cabinets and window seats, and that will guide refinishing at some point.) 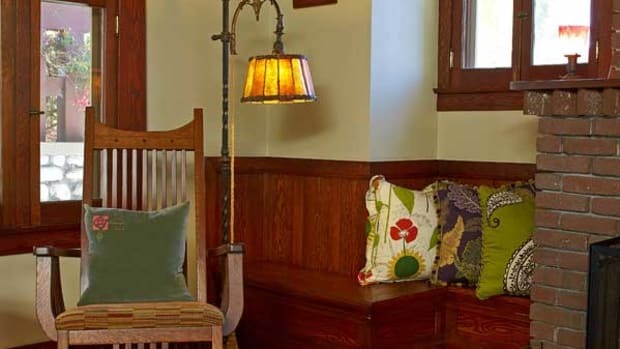 Just off the living room with direct access to the front porch, the room provides an interesting glimpse of gender dynamics in the Arts & Crafts period. This room, where men retired after dinner to drink and play billiards, has six separate doorways (including those that open to the courtyard and front porch, for smoking) and its own bathroom. Pocket doors could be pulled shut to close this room off from the ladies. The room is well detailed yet informal, with a rustic brick fireplace and unique ceiling beams carved with a Southwest-style motif. When Phil and Nancy pulled up the carpeting, they found a well-worn foot track in the floor finish, pointing to where the billiard table had stood. Replacing a 1970s remodel, the new kitchen is a simple take on California Craftsman design, with plain white subway tile on the stove wall. 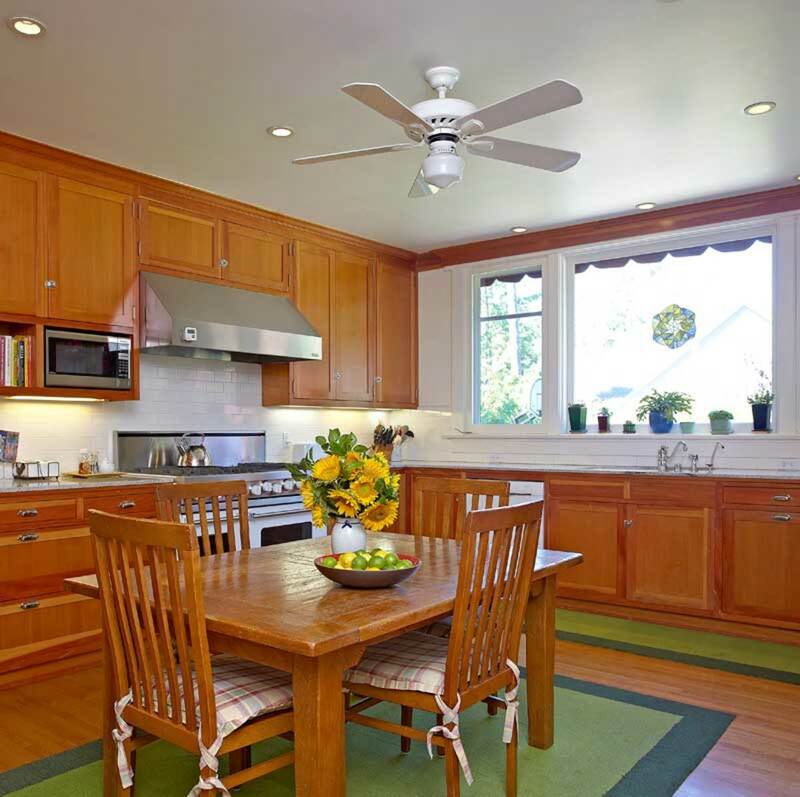 The remodeled kitchen featured dingy flooring and accents in avocado green; the butler pantry had been incorporated, probably in the 1970s, too. Nancy and Phil went with the modified floor plan but enlarged the room by taking a bit of space from the laundry room. A unique buffet passes through into the original dining-room buffet, the back of which had been removed at some point. The new hinged window admits more light into the kitchen, and facilitates serving. 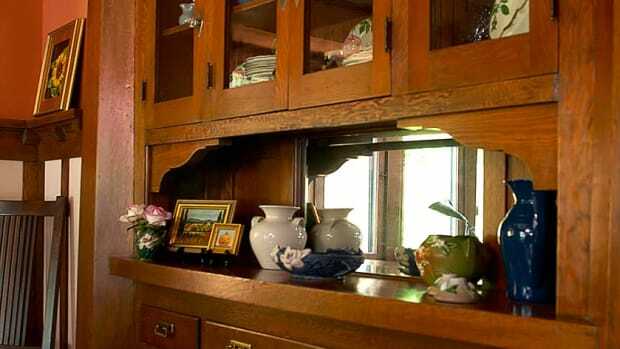 The dining room retains its large built-in buffet with leaded glass. Although his work in Southern California ran from San Diego to Santa Barbara, architect Sylvanus Marston made a special mark on Pasadena. When Marston established his firm in 1908, he joined an elite group of contemporaries, including Myron Hunt, Frederick Roehrig, and Charles and Henry Greene; together they established Pasadena as an “epicenter of architectural creativity” and a wildly popular winter resort for people from the Midwest and East Coast. In 1914, he hired Garrett Van Pelt; Edgar Maybury joined the team in 1921 to form the influential and prolific firm Marston, Van Pelt & Maybury. 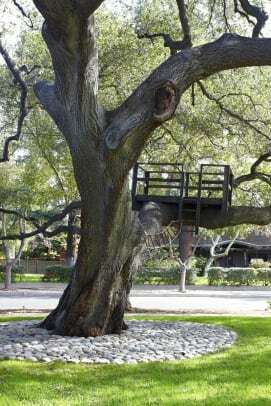 Marston is associated with more than a thousand structures in the Pasadena area. With a vaulted ceiling, wide curved window, and original Batchelder tile in the fireplace surround, the living room is dramatic. The owners cleaned and restored the tiles, and stripped the quarter-sawn oak mantel. Marston created fine homes in styles that included Tudor and Mediterranean Revivals, but his early work centered on Craftsman design. He is widely credited with creating the concept of the bungalow court, multi-family housing that involved groupings of small one-storey houses or duplexes oriented around a common landscaped courtyard. His St. Francis Court, built in 1909, was the city’s first. 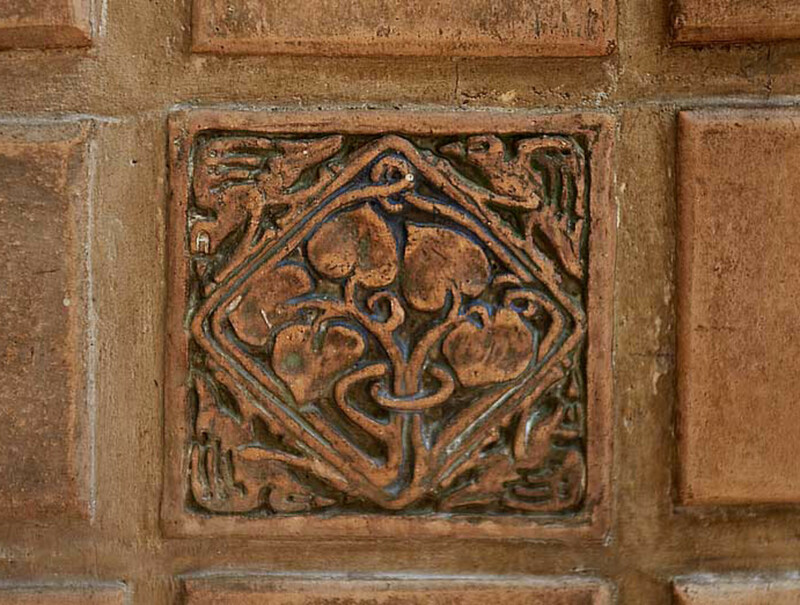 The Lacey House exhibits Marston hallmarks. 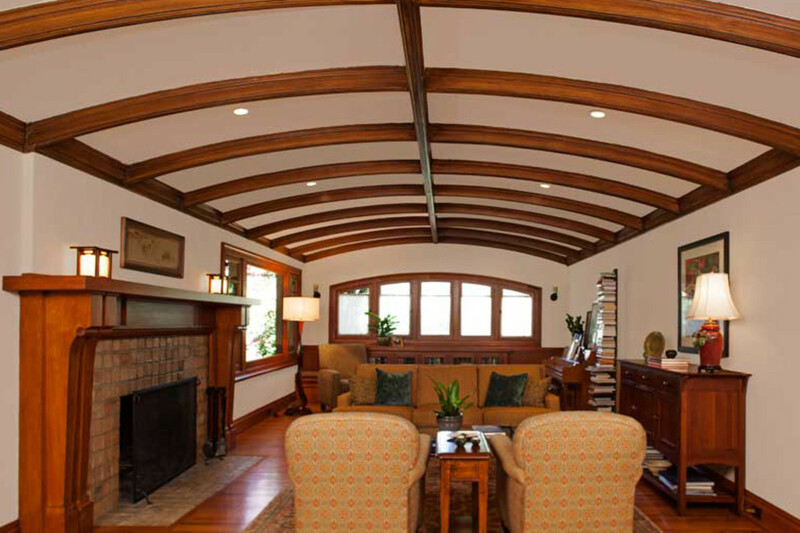 Barrel-vaulted ceilings were one of the architect’s favorite motifs. 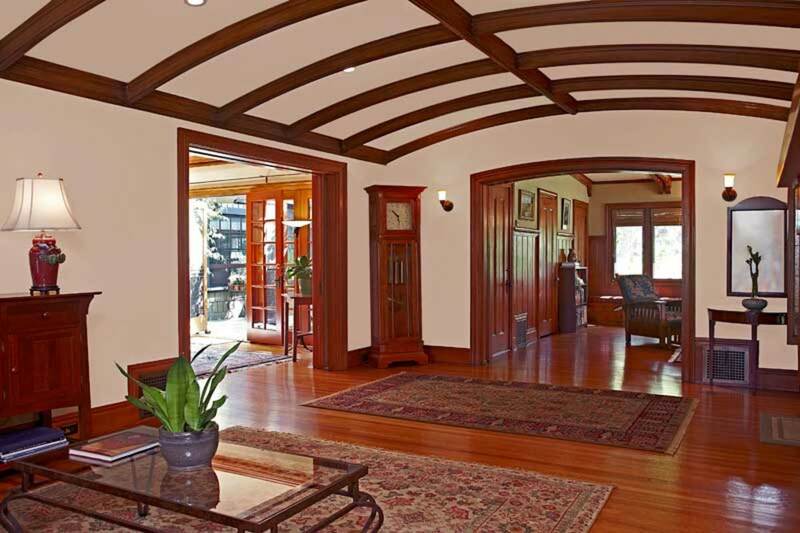 He favored the use of graceful arches, seen here in the ceiling beams crafted from Port Orford cedar (a favored material), mirrored also in the arched west window frame and the doorway leading to the billiard room. 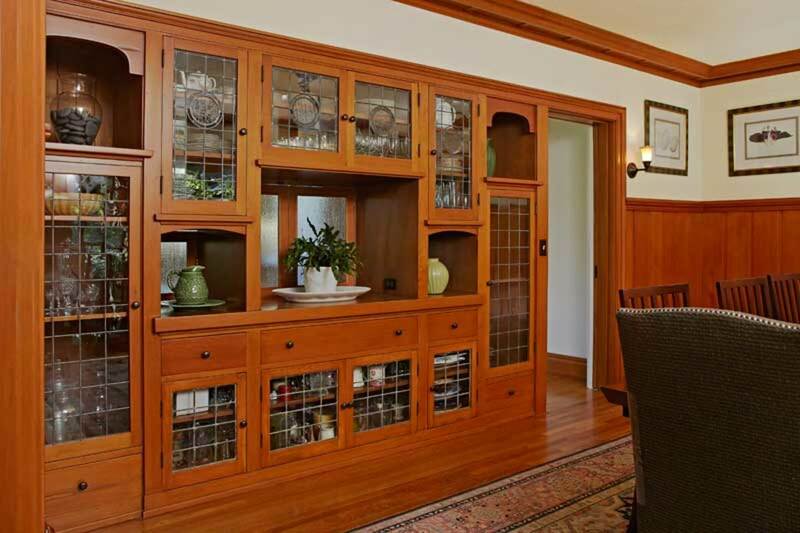 Marston also used leaded glass and often incorporated a concentric circle design, present here in the built-in buffet and the bookcase. 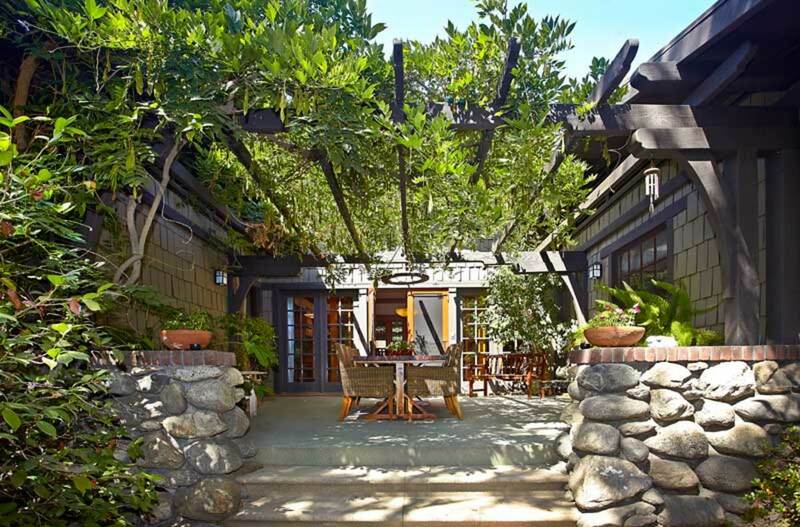 Finally, he embraced the Arts & Crafts ideal of blending interior and exterior space to support good ventilation. 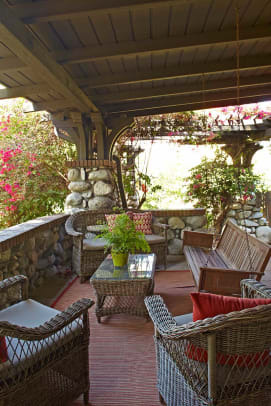 Here, numerous windows, a peaceful loggia, patio gardens, and the grand front porch support the enviable lifestyle of Southern California. 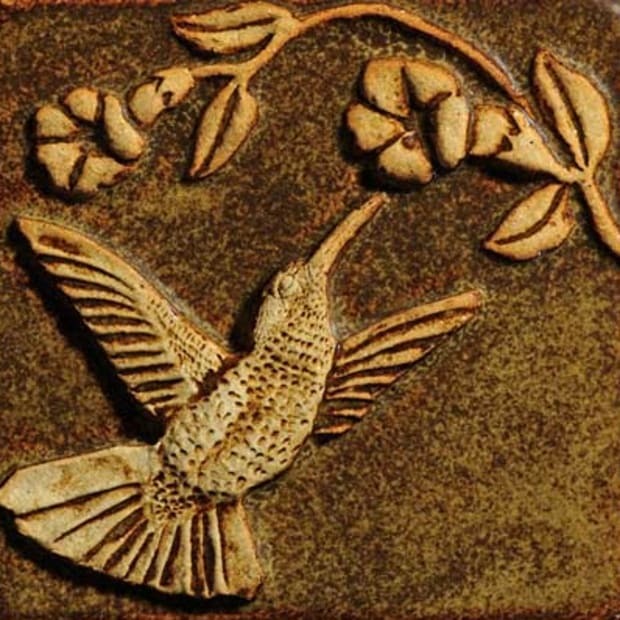 Original Batchelder tile from the fireplace surround. 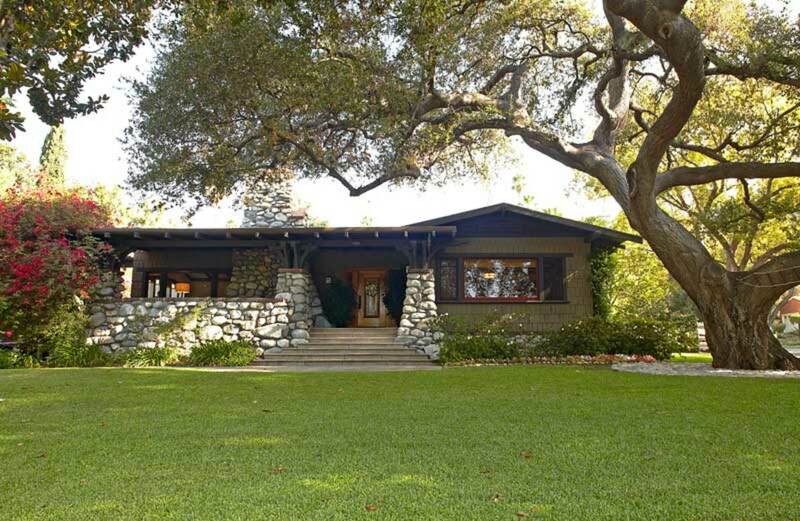 Along with a discerning use of salvage, homeowners in Pasadena relied on research and keen observation of the house to bring back a modest bungalow.